Buy The Best Cordless Clippers for Professionals! This is one of the best hair clipping products that you can buy if you are looking to attempt cutting a lot of hair in a short span of time. This is a hair clipper that features detachable blades that are made of high quality ceramic. The blades are sharp and well pointed and are of highly durable quality. You can easily get the finest and most precise of cuts when you do use this hair clipper for professional hair cutting and trimming. The fact that the blades are quite durable makes this product one that is definitely worth buying at any given point of time. Once you have the Andi Supra ZR in your possession, it will not be before five to six years that you will need to get yourself a new pair of hair clippers. This is a hair clipper that is also capable of running for as long as two hours at a stretch without the battery running out. The hair clipper comes with a powerful charger and you will have to charge the clipper batteries for just two to three hours in a day in order to be able to use it continuously for the entire day. 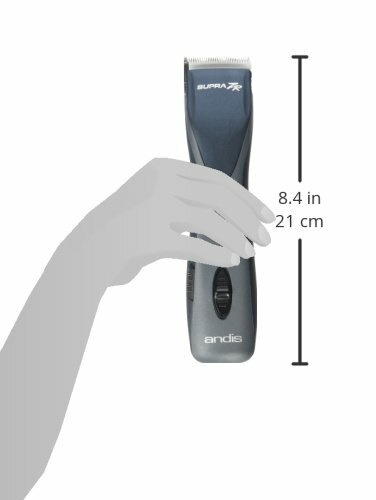 A powerful rotary motor makes hair cutting a task that is highly efficient when you use the Andi Supra ZR for this purpose. The speed that comes with this hair clipper is absolutely amazing and you can expect to carry out eighteen hundred to three thousand eight hundred strokes in a minute when you opt for the use of these hair clippers. The speed of the hair clippers is also something that is easily adjustable. The Supra ZR is a pair of hair clippers that is quite bulky in size. Yet it comes in cordless mode making its function and method of use quite flexible for you.